So, I’ve just driven a gti and R back to back. I can honestly say that I was surprised. The gti for me felt far more alive and exciting. Coming from the S3 I thought it would feel a little down on power. Not all at. It just made me smile. Great to drive a gti again. If there’s no tcr, I think I might have found my next car! Also I’m normally a manual person but the dsg was great. Only downside was that it could have been louder. Go out in a Clubsport, you'll be blown away! That’s the thing. I’ve tried a clubsport and wasn’t blown away. I just expected more. Looked amazing but not as quick as I’d hoped. I’d probably still get one though! Think I might go down the dtuk route if I go ahead. Going to wait until January and have another look I think. Just really surprised how much I preferred the R. It felt so heavy after the gti. On the plus side I was offered a white, dsg, 90% tints with Brescia for December delivery. They had a fair few in stock so bypassing the crazy lead times. Just really surprised how much I preferred the R. It felt so heavy after the gti. This!!! I drove all 3 back to back - I set out with the intention of getting a Golf R but like you I thought it felt heavy in comparison to a GTi. Would've gone with a Clubsport but it was more than I was willing to spend at the time. Managed to find an incredibly well specced 3dr GTi PP. I planned to get it to stage 1 to get it to the same power as a Golf R but I'm enjoying it as it comes at the moment. Honestly, if I did not love driving Golf’s so much, I would of moved on to BMW or another brand by now, but anyway hope you enjoy all the testing and spec choices....all part of the fun of being a petrolhead I suppose! Thanks for the replies guys. Interesting to hear that others felt how much lighter the gti seems on the road. Obviously it should feel lighter but surprised by how much. I drove the gti as I thought I should and was expecting to think it was fun but not for me this time. Don’t get me wrong, the R was fantastic and a great choice. Just lacks a traditional hot hatch feel to me. More like an exceptionally quick cruiser. Completely get what you mean about loving golfs. 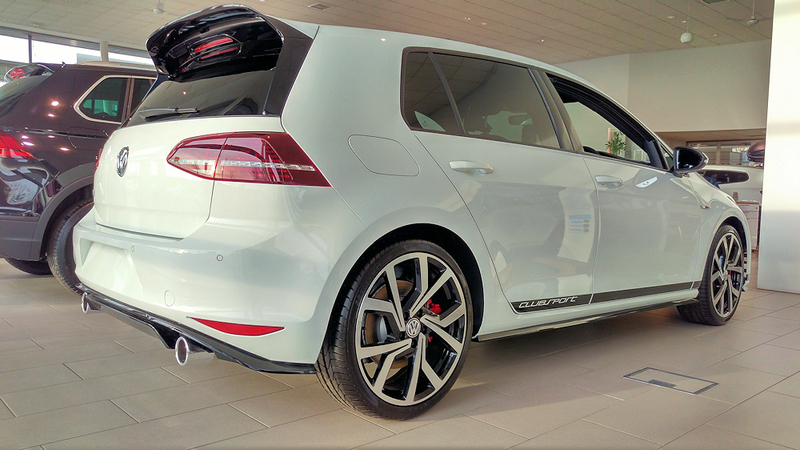 I’ve tried so many other manufacturers this time only to come to the conclusion that gti number 5 is the way to go. My wife just laughed when I told her. So predictable! Same here, went to buy the R and test drove it and then thought the GTI looks better and had a test drive in on as well. The GTI was much more fun to drive a proper hot hatch feeling. The R was too much like the car I was trading in as I got bored with it. The GTI still brings a smile to my face every time I drive it 4 years on. I test drove an R and a GTi - same as most responses, thought the R felt heavy and looked bland (inside and out) the GTi just looks better (imho) and the tartan seat make the interior special.